Full disclaimer: I know Jen as she’s the programming director for GeekGirlCon. She’s awesome, makes delicious pizza, and has two adorable dogs, Giles and Wesley. 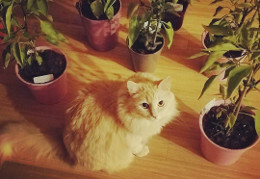 Jen also has a blog you should read. However, she has in no way influenced or otherwise bribed me with puppy snuggles to write this review. Back to the book, Ink-Stained Amazons and Cinematic Warriors: Superwomen in Modern Mythology is about heroic women characters in modern media (1940’s to today) and what their stories say about our society and most importantly how our society views the roles of women and their potential. The book is very accessible and easy to read, even if you aren’t familiar with every movie, show, comic book, or novel which Stuller references. (There’s an appendix filled with footnotes and notes on characters and the author’s own recommended reading and viewing.) It’s definitely a geeky book as Stuller is very excited to share with you, the reader, about the media and super-powered women she loves. But at the same time, Stuller is very much an academic feminist, who chooses instead of harshly critiquing the flaws in the media she discusses to celebrate the strengths and the good points. This is not a bad view to have. It is just different than my own; and at many times in my reading, I wanted to say, “But!” (I can love Buffy: the Vampire Slayer without particularly loving Joss Whedon, for instance.) That said, I still enjoyed her viewpoint, and I do cherish many of the texts she discusses despite their flaws. In Section II, Stuller covers what she calls the ‘Journey of the Female Hero.’ But I would rather say it’s actually about the hero’s family-structure as Stuller digs into how women heroes gain strength from those around them, e.g. Buffy and the Scoobies and Xena and her relationship with Gabrielle. In Section III, Stuller discusses current myth making by women creators and the question of where these texts are evolving too. This section was the least organized, and Stuller seemed to drift from topic-to-topic in a way that she previously did not. She also seemed to go back to some topics she’d already discussed, particularly journeys of heroic women and their mothers. And I can somewhat empathize with the task of trying to write history as it happens and not having the distance. I hope that Stuller can update this book as our female heroes grow. Overall, as a pop culture fan, I enjoyed Ink-Stained Amazons and Cinematic Warriors and would recommend it to anyone interested in how heroic women are portrayed in pop culture. This book would also make a great companion reader to a class about heroic women. I’m also happy that I got a few recommendations of texts to try myself that I hadn’t heard of like the British spy Modesty Blaise. 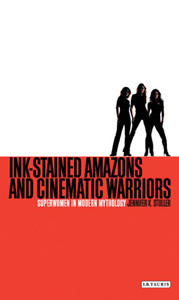 Read more about why your favorite female heroes are awesome, buy Ink-Stained Amazons and Cinematic Warriors: Superwomen in Modern Mythology by Jennifer K. Stuller and support this blog. You can also check out Stuller’s geeky recommendation list , which features a lot of the media she covers in her book.